For all the nights when you can’t deal with figuring out where to get dinner. The great LA vs NYC debate will forever live on. And why not? There’s leverage to both sides. But one thing that will always remain true is how much more time New Yorkers waste debating the whole thing. And this is the city that INVENTED wasted time. In reality, most LA residents will probably tell you they think Los Angeles and New York are both great cities and they enjoy facets of each. And that drives New Yorkers even crazier. But breathe New York, because at the end of the day, you will always be cool to us. We have enough sun-drenched patios and poolside drinking holes to suffocate all of Palm Springs with, so when someone comes in with long black booths, dark-paneled wood and light bulbs hanging from the ceiling, we take note. Welcome to Village Idiot. The most New York spot smack dab in the center of Los Angeles. Maybe it’s the dim lights, or the exposed brick, or the fact that it doesn’t try to be cool, it just knows it intrinsically is, but every person we bring here for the first time tends to say, “Wow this feels like New York” when they walk in. But the massive success of this place isn’t just about the city it emulates. Instead, Village Idiot has created a vibe so desirable, it’s hard to find something to nitpick on. Wanna come for brunch? Great. Happy hour? Awesome. Late night snacks? Even better. Or maybe just do what most people do and hang at the bar, talk to attractive people with good jobs and take advantage of one of the better craft beer lists in town. Village Idiot is also big, allowing anyone to basically self-create the vibe they came seeking. The front tables are nice and festive, while the booths in the back cater to more private gatherings. Across the board, the food is quite solid and immensely hearty. There’s an English slant to the menu (and all of Village Idiot) and that couples beautifully with whatever IPA you’re drinking. Village Idiot shows no signs of stopping. It knows exactly what it is and exactly how it’s supposed to be done. See, New York? BE OUR FRIEND. Their signature dish. Hearty but (somehow) not heavy, the perfect combo so you can keep drinking. Butternut squash and sunflower seeds top this savory and fulfilling starter. Definitely big enough for a meal. Good Lord, these are so good. Plan for these to not stay on the table long. It’d be a bummer if this place didn’t serve a good burger, and luckily, you can keep your disappointment at home. The English might not have great food overall, but they sure know what the f*ck to do with breakfast. It’s that sneaky, spicy slaw on top that makes this a must-order. How many times can you say you’ve ordered quiche at a bar and lived to tell the story? Village Idiot gives you that opportunity. Blackbird is a casual pizza spot on Melrose serving decent deep-dish. Ddong Ggo is a lively Koreatown bar with a smoked-filled patio and excellent fried chicken. The Doughroom is a solid restaurant in Palms, an area of town without many solid restaurants. 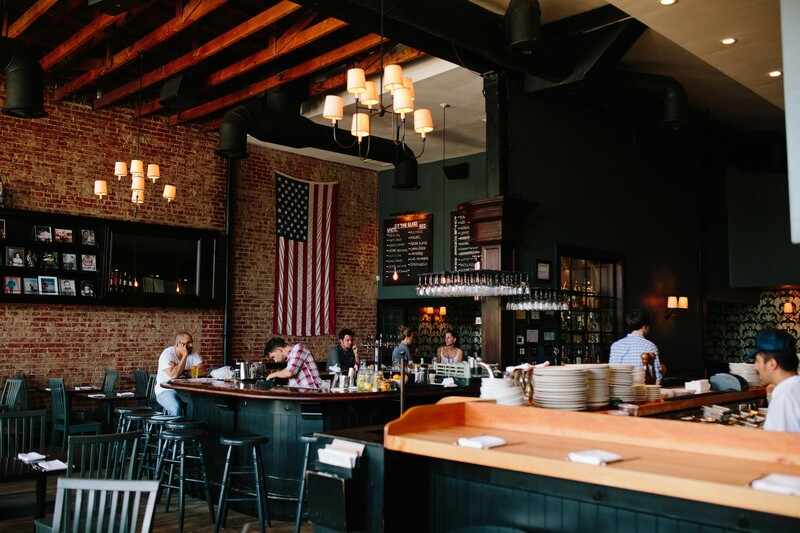 The Brixton is a neighborhood bar in Santa Monica with one of the best Happy Hours on the Westside. Village Tavern’s not fine dining but if you pick your dish right, you can still have a good time. And even if you pick your food wrong, this place is just too damn likeable for you to get <i>too</i> upset.